Since 2007 the Cleveland Urban Design Collaborative of Kent State University has run Pop Up City, a program that brings vacant urban space to life through fleeting interventions. Cleveland lost half of its population since the 1950s, and much of its urban fabric is unused and deteriorating. 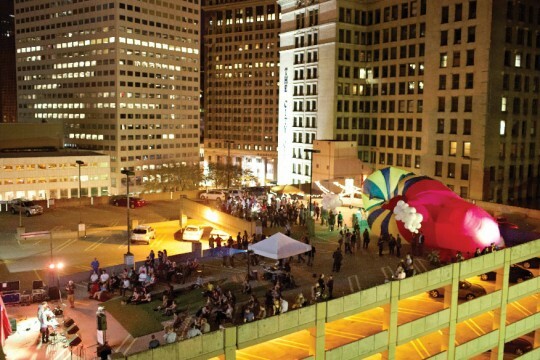 Pop Up City aims to spotlight some of Cleveland’s spectacular but underutilized properties, while demonstrating that vacancy can be an opportunity and an adventure, not just a liability. Past interventions have included an ice sculpture park on the banks of the Cuyahoga River; a roller-disco on a vacant floor of an old industrial building; and an inflatable music venue on top of a parking garage, demonstrating possible alternative programming for structures that are used only during certain hours of the day.